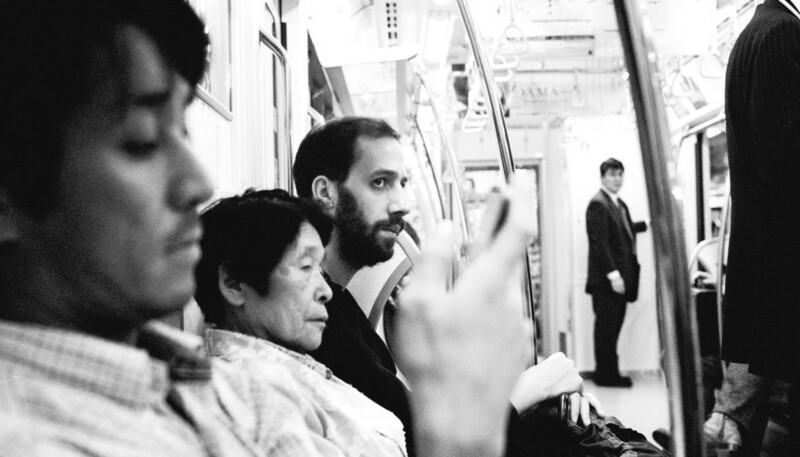 A self-confessed Japanophile, Gold Panda’s new album is inspired by extensive travels around the country and named after the English translation for the Japanese idiom “gambatte kudasai.” Here, Derwin explains the inspirations behind Good Luck And Do Your Best, and discusses his complicated feelings towards music as a career. Good Luck And Do Your Best was started almost by accident, right? Well, I didn’t know what to do because I have a love/hate relationship with what I’m doing. It’s a hobby first and foremost, and then it’s become a job. Which is great, but then you start to see it in a different way, and I wanted to get away from that. So I decided to not make any music and to go to Japan with a photographer, with the idea of doing a book and making some field recordings. Then I came back and just started another record, by using one of the field recordings to start the first track. And that was it really. I guess you just need a starting point. It’s interesting that you say you have a love/hate relationship with making music. In previous interviews you’ve mentioned that you hate playing live. Is that still the case? I’m trying to make it interesting for myself too, by actually having stuff to perform rather than just standing behind a laptop and pressing the space bar. I’ve had to come to a compromise between making it sound good and being able to actually perform something. So, yeah, I’m getting used to [playing live] as it just being something that I do, and I’m putting less pressure on myself. I have a love/hate relationship with what I’m doing. It’s a hobby first and foremost. Good Luck And Do Your Best feels a much more serene record than Half Of Where You Live. What inspired that change? Well, I guess because I was living in Berlin when I made the last album, I thought I should be making club music, and that probably wasn’t what I should make. With this one, rather than trying to make a record, it happened over a long period of time, where I just constantly made tracks. Eventually you get a theme or sound coming through, so rather than you deciding what to do, it makes itself, or it presents itself to you. And yeah, I think this album has this returning home feel, so it’s a lot calmer but there was no plan. I guess it captured the calmness of Japan. Can you tell us about your connection to Japan – what is it about the country that inspires you? The first time I went to Japan, I was 19. My friend was living there, making techno, so I went to see him and instead of having a holiday I just went to his gigs, clubbing and drinking, doing no tourist stuff whatsoever. It was great. Even before that, I got interested in anime and Manga, and wanted to see what kind of a country that kind animation came from. I ended up going to live with my friend in his flat for a while and then I taught English there, which I really didn’t want to do but I wanted a way to earn money and travel around the country. And then I came back to England and did a Japanese diploma at the School of Oriental and African Studies in London, which probably the best thing I’ve ever done. I’ve just been going back [to Japan] ever since, and the friends I made on my first visit I’ve kept, and they’ve had kids so I go twice a year to try and keep my language up, and get to know my friends’ children. I can’t explain exactly what it is about Japan; it’s many things and nothing. Maybe it’s more of an atmosphere; there’s a calmness you get in Japan, which is hard to explain. It’s just a constant source of inspiration. So you’ve never been tempted to move there permanently? When I first went, I was really interested in living there. I went for on one of these interviews for marketing for Japanese banks. I don’t know how to do those jobs, and I was just blagging it on the fact that my Japanese was really good. But I just didn’t have any love for it, and then music happened and I was able to live from my hobby, so now I’ve got a job where I have an excuse to be in Japan. I’ve achieved what I wanted, without having to play by the rules of getting a job. And living [in Japan] is great, but I lived in Germany for about three years and I really missed the UK. I just moved back to London from Essex and I’m enjoying it. I grew up in Peckham, and it was quite rough when I left and now it’s kind-of nice. So it’s a different city to what it was, but it still has that exciting melting pot of people, and you wouldn’t get that in Japan. “Cinematic” is such a clichéd description of instrumental music, but with this album you do really get a sense of surroundings and place. Are songs ever triggered by landscapes or images? I guess so, but it’s more an abstract thing; you make sounds that conjure up a feeling. It’s hard to explain, but you can evoke feelings through certain melodies. And when I think of imagery to go with tracks, I feel like they’re quite a wide shot of something, mainly a scene or buildings. Because I travelled Japan with Laura Lewis – who did the photos for the album – I had some of them printed out and pinned up in my studio. So I was able to look at these images and try to make stuff at the same time. Generally, I spend a lot of time observing scenes instead of people. While there are songs on the album that feel quite euphoric, many are underpinned by this sense of wistfulness, if not melancholy. Where does that come from? But I don’t know. I do agree. I don’t really want to make the music I make but I can’t help it. I think you’re out of control to a certain extent; you can guide things, but I think you will always end up sounding like you. Before, I used to hate that but with this album I’ve been more accepting of myself, and that’s why it worked better to be more honest and not try to be something else. What are you most proud of about this record? I think being honest. It’s more honest than the other records, because I don’t think there was any of me trying to make a certain style of music. I’d listened to a lot of 90s hip hop, and that’s been a constant source of inspiration, and I was using sounds and old equipment in the way that I knew, and not worrying about current trends. And I was more confident in what I’m doing and what my music sounds like. It doesn’t sound like anyone else, so maybe that’s good. The video for "In My Car", with you hanging out with your grandma, is so great. It’s nice to get an insight into a personal relationship. I was worried that it was too personal but then I think what was worrying me before was that things were too personal and being honest would make me look weak or weird or, you know, ugly or whatever. It’s just all your insecurities are there on film or in music, and I think that can be quite daunting. But coming to terms with it, it’s just part of getting older maybe, and it’s worked out better because there’s no gimmick or anything to sell. In the video for "Pink And Green", there’s footage of you singing karaoke. What’s your karaoke song of choice? "Englishman in New York" is a good one, and "My Way" by Frank Sinatra. And then any R&B tunes. I really love that JoJo track "Leave (Get Out)", I always do that one but it’s really hard to sing, and I can’t sing. That’s why I don’t have vocals on my songs. (Laughs) Aaliyah’s super-hard as well. And Mario's "Let Me Love You". And then you’ve got to do Oasis. Anything by Oasis is genius because they’ve basically made music that anyone can sing, because it’s just shouting. There’s no performance element to Oasis; it’s just regurgitating the lyrics in a loud, manly voice. It’s been six years since your debut came out. Have your motivations have changed in that time? Yeah. I mean, I think after 10 years I’m calling it the end. I’m considering that. Well, I think you’re a different person over the course of 10 years. I regret the name, that’s for sure. (Laughs) Although other people seem to like it. I didn’t give it much thought because I didn’t think it was a big deal, and then it ended up being the main thing in my life. So I don’t know. I don’t want to eke out a Gold Panda career just because that’s what I’m doing. I think, when it ends, you end it on a good note and you try something else. I make a lot of different music, but only release one certain type because it takes up all my time. So I’m speculating, but I think I’m happy to call it a day after maybe four or five albums. Sorry, that’s not the positive answer you wanted. (Laughs) I feel like I’ve done three albums that have a similar arc to them – they’re all 11 tracks, they’re fairly “pop” – so maybe I’m free now to do something weird, or something else that’s still Gold Panda but doesn’t have to be in the same set-up. I’m free to explore a bit more.